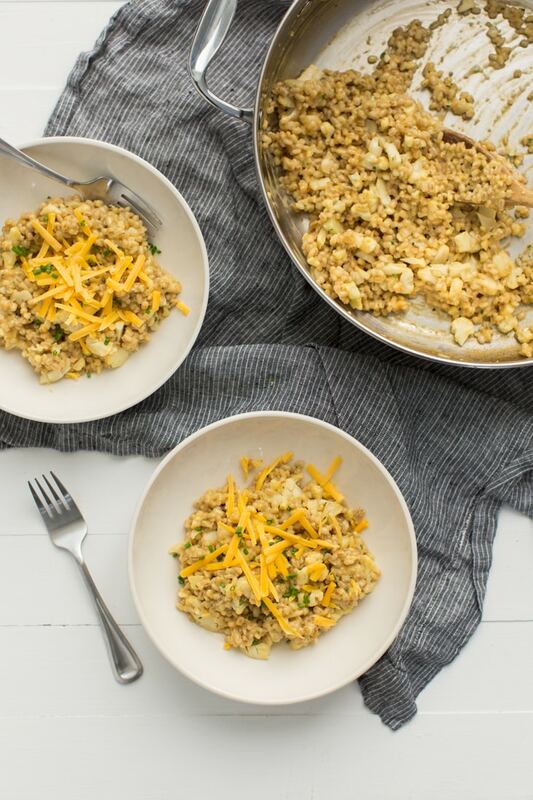 Barley Risotto with Cauliflower and Cheddar | Naturally. It is quite amazing what pregnancy forces one to do in terms of food. I’d be telling you a bald-faced lie if I said that I ate like you see on the blog 100% of the time. I try but I have my days where I run out of steam by 3:00pm, days when even looking at the kitchen makes me cranky, and days I just want to treat myself. M and I order pizza or go pick something up but as of late, it’s no good. If I even look at a french fry the wrong way, I get heartburn. BBQ Chips? Forget it. Oh, and that pizza? No way. (Mind you, I tried to limit these things while I’ve been pregnant, but I still like to splurge). Given the heartburn, I’ve been cooking up a storm. I love a good barley risotto and contrary to some beliefs, it’s really not that hard- it just takes some (passive) time. I’ll often make barley risotto if I need to do a bit of kitchen cleaning. If my recipe direction reflected that, it would be: add the 1/2 cup broth, wipe the counters down, add another 1/2 cup broth, empty the dishwasher. Then before you know it- you have a clean kitchen and something delicious for dinner. In a sauce pan, bring vegetable broth to a boil, reduce to a simmer, and let sit while making the risotto. Heat a medium pan with high sides over medium heat. Add in 1 tablespoon olive oil, followed by the cauliflower florets. Cook, stirring often, until the cauliflower is tender and lightly browning, 10 to 15 minutes depending on the size of your cauliflower florets. Remove from pan and set aside. Return pan to heat and add in the other 1 tablespoon of olive oil and barley, stirring and cooking for 2 to 3 minutes. Add in the minced garlic and a bit of salt, cooking for another minute. Finally, stir in the white wine. Add 1/2 cup of the stock and stir. Let risotto cook until nearly all the stock broth has been absorbed. Add another 1/2 cup and let absorb again, repeating the add broth/let absorb, stirring frequently, until the barley is tender. Check after 20 minutes. Barley will be soft but still have some firmness to it. Stir in the cauliflower, cheddar, and chives, letting the cheddar melt. Serve with an extra sprinkle of cheddar and chives. 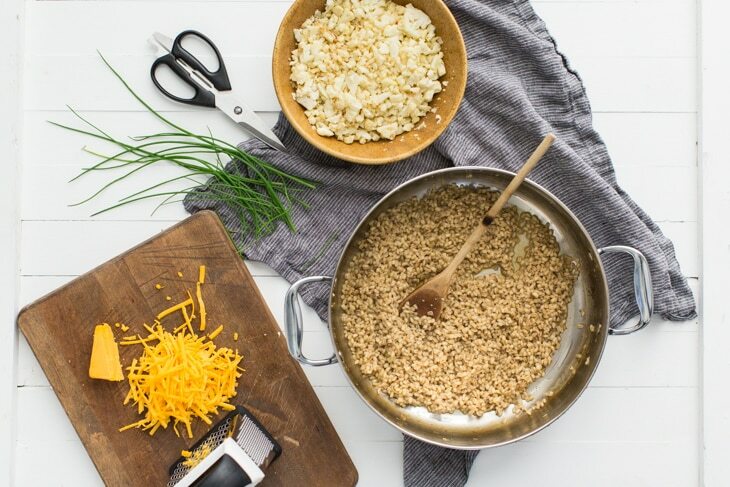 *Barley Risotto recipe from Mark Bittman. I totally agree it’s not hard at all this recipe looks delicious I will be trying it next! I I like risotto too but i dont know why i dont make it very often. A delicious, genius solution to the horrific heartburn! 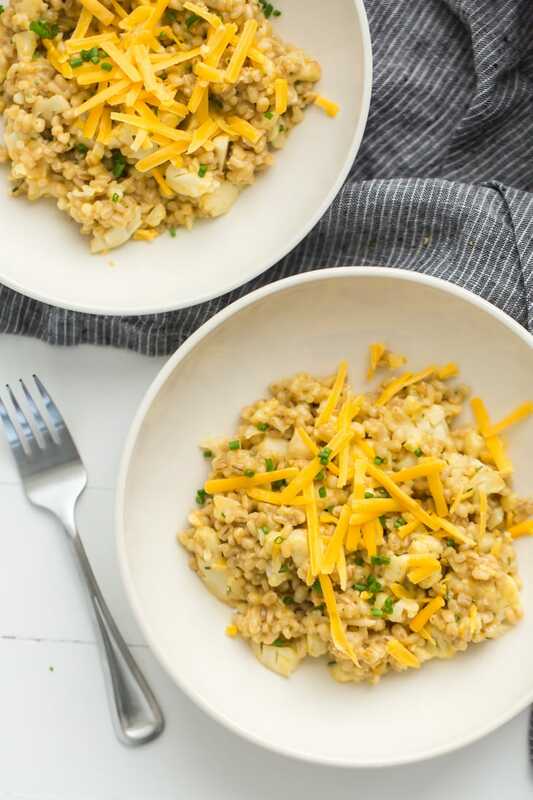 This sounds so delicious, and I always forget about risotto until I go out for dinner – will have to give it a go! I often make risotto with pearled spelt, so will try this using that. Risotto is the perfect kitchen cleaning dish! You just keep a light eye on it, then you have a creamy, comforting reward at the end of your work. Love that you used barley for this. One of my faves! I make this kind of dishes quite often and prefer pearled barley or spelt to arborio rice. And I fully agree that making risotto isn’t that hard, and the result s always great. Thanks for this lovely recipe! Yummy! Do you think this would work with hulled barley? I think so- it would probably just be a bit more chewy! Looks delish! I plan on making it tonight. Question though: You list 2 tbs of olive oil. One for cooking the cauliflower, but when do you add the 2nd tbs? When you cook the barley for 2 to 3 minutes? Ah, good catch and I just updated the recipe. You are correct- the other tablespoon goes with the barley! Thanks! I look forward to having this tonight! 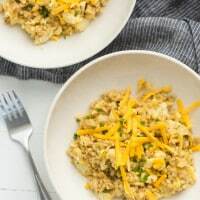 I’m making this now but the liquid is just not absorbing like it does with the arborio rice. Eek! OK, update. I cranked up the heat and it was fine. It did take longer than normal rice though. Everyone was impressed! Glad it eventually worked out- just out of curiosity, did you use pearled barley or did you pick up hulled or hulless barley? Sometimes the latter doesn’t soak up the liquid well at all! What can I substitute for the white wine? More stock? Yes! The white wine helps to loosen up any stuck on pieces too, so that might not happen but that’s okay. I have made this twice in the last few weeks. It is delicious. I only had a 1/2 c of barley the second time so I added 1/2 of wheatberries to the mix. They cooked at the same rate and it turned out delicious. Just made this. Tastes yummy. Will do again. Overall pretty good. A little salty but delicious. Next time I’ll skip on seasoning with salt since the broth condenses down and gets salty. Great with a simply seasoned pork chop!